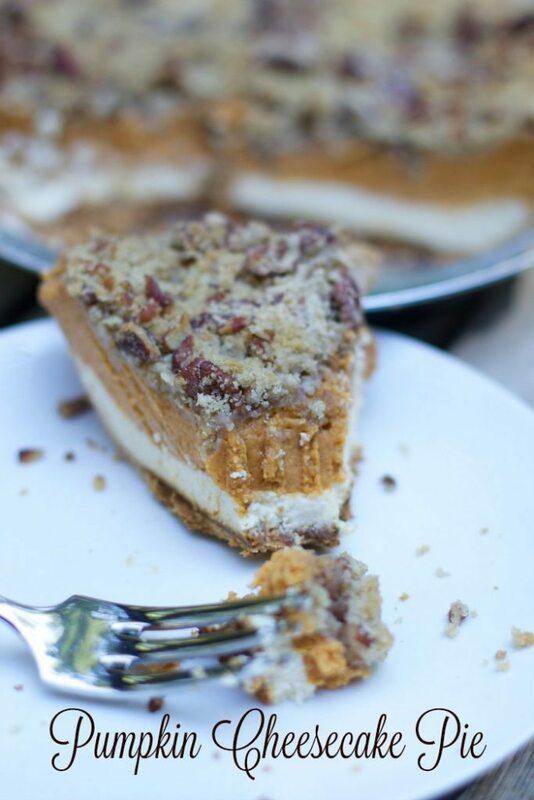 It’s fall and need I say anything else but PUMPKIN RECIPES! 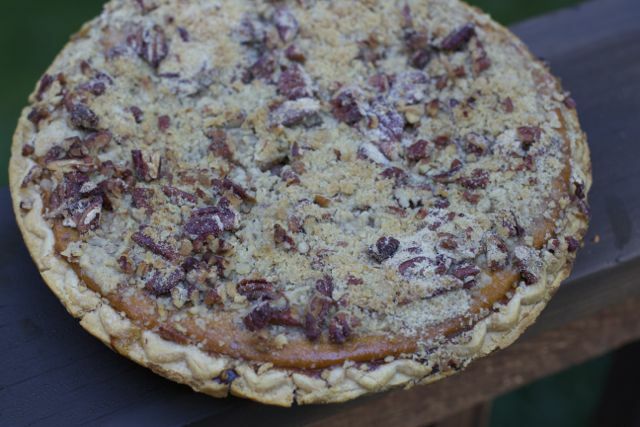 Not only are we gearing up for some yummy Thanksgiving pies but with cooler weather, I don’t mind turning up my oven and getting all those delicious scents and spices around me. Pumpkin pie can be boring at times, but this year we are making pumpkin pie recipe with a twist. To mix things up this year, we are not only adding a yummy crunchy topping but a layer of cheesecake to the bottom. 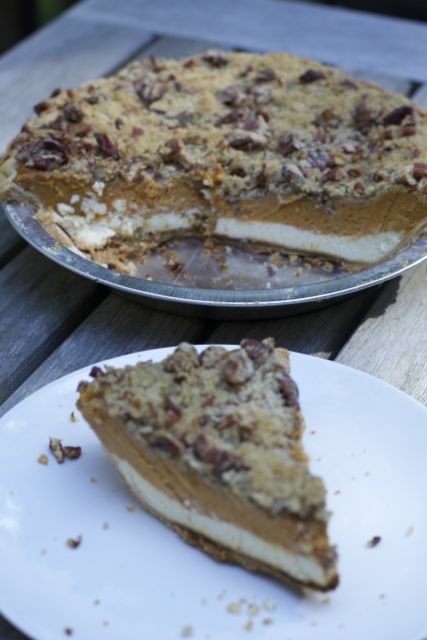 You will want to sink your teeth into this Fall or Thanksgiving dessert recipe. Do not be intimidated by the word cheesecake. This is really just a layer of cream cheese, sugar and eggs. 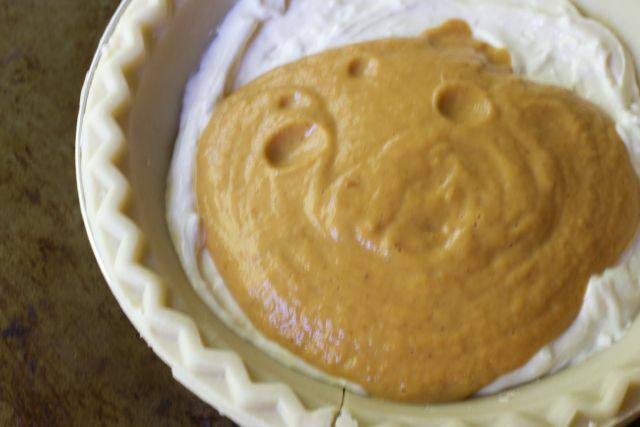 It adds some dimension to the pumpkin pie. After allowing it to cool you can make the pumpkin pie filling. 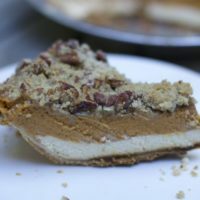 Super simple as I used a pre made pie crust and then just layered the cheesecake layer and the pumpkin pie layer all at once. It will cook like this for most of the time. As if it’s not good this way. 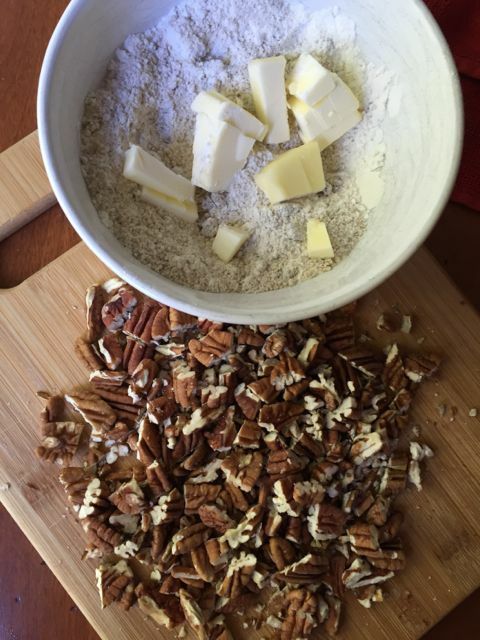 With only about 10 minutes left to cook, it’s time to make the crunchy pecan streusel topping. How can things get any better than spices and pecans? Allow to bake until the pie is completely cooked. You now have a masterpiece of flavors. 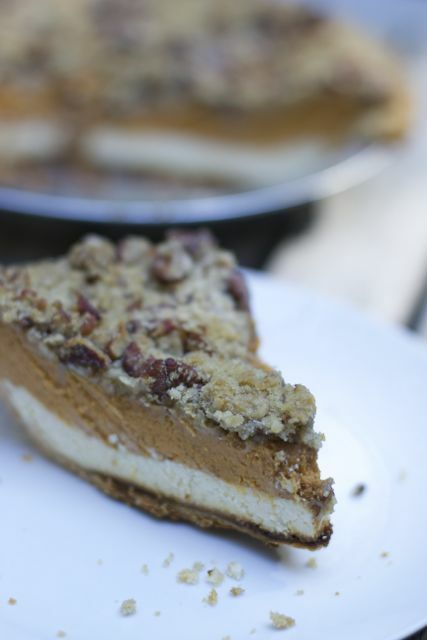 Ok a little closer look to see all the yummy flavors that create an amazing pumpkin cheesecake pie recipe. Ready for a bite I am sure. 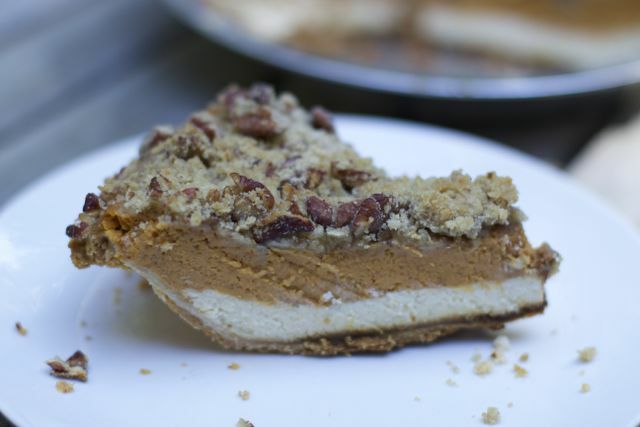 No need to wait for Thanksgiving Dessert for this one, Fall is a great excuse to indulge in PIE! In a mixing bowl, beat the cream cheese until smooth. Add the sugar, vanilla and beaten egg and beat until smooth. Refrigerate for 30 minutes. Spread the mixture into the bottom of the pie crust. In another mixing bowl, combine the pumpkin, evaporated milk, 2 eggs, ¼ cup sugar, ¼ cup brown sugar, cinnamon, salt and nutmeg. Beat until smooth, then very carefully pour the mixture over the cream cheese layer. Place the pie on a cookie sheet in the oven and bake for 25 minutes. 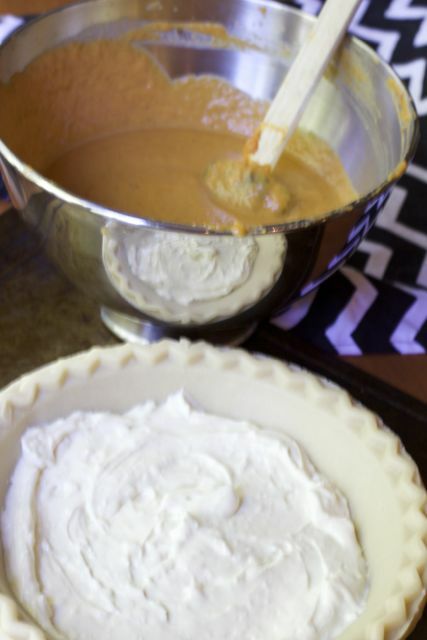 Cover the edges of the pie with foil, then bake an additional 25 minutes. In a small bowl, combine the flour, brown sugar and butter. Cut in the butter until the mixture looks like coarse crumbs. Using 2 knives or a pastry blender. Stir in the pecans. Sprinkle the crumb mixture over the top of the pie. Return to the oven and bake another 10-15 minutes, or until a knife inserted into the center of the pie comes out clean. Cool the pie for 1 to 2 hours, then transfer to the refrigerator to cool completely. Take out 15 minutes before serving. How do you take you Pumpkin pie whipped cream or ice cream? Looks yummy. Thank you for the recipe.